Physically and materially, financially, economically. It can mean status and position, the way people see you and think about you. It can mean mentally, how smart you are, or at least how intelligent you appear to others. It can mean emotionally, measuring up to the goal and ideal of happiness and joy and all those things we want to feel each and every day. It can also mean measuring up spiritually to some ideal that pastors and churches have placed into our heads. This last one strikes me as quite significant as we sit in this sanctuary today. We sometimes try to measuring up to some belief that we are supposed to have. We will even deny our authentic doubts and questions because of feeling we need to measure up spiritually. We may deny our need to grow spiritually because we don’t want God or others to think we are not already “saved” – as if salvation was the one time event that too many pastors would have you believe. FYI: Salvation is an everyday event! Salvation is a way of life! Salvation doesn’t simply happen one day when you come forward, give your life and are baptized. Salvation is giving your life everyday. Salvation is knowing that each day you need God to step into your life to lift you out of the muck and mess. Salvation is an ongoing process. Okay, but that is another sermon…. Let me get back to this sermon! Anyway, as I thought about the tyranny of measuring up, I realized how my head is filled with things that I think I should do, things I’ve been told I should (or shouldn’t) do. The weight of trying to live up to expectations can be overwhelming. Expectations like these fill our hearts and minds with clutter. My head sometimes feels like that drawer that is so chock full of clothes or tools or kitchen items that it won’t close…or when it does close, you can’t open it back up! You pull and pull but something has it stuck! I feel like Joanie and I have lived this way for most of our married life. In Charlotte, our home was crammed full of both people and stuff! Our first house was 3 bedrooms, 2 bathrooms. Well, sorta 2 bathrooms…one wasn’t completely functional! For a time, in that little house (little by today’s standards, but big for the time it was built in the 1930s), we had 8 people living in it. Yep, 8 people – 5 adults and 3 middle schoolers. The house was cramped enough when the first 4 of us moved in because we had the sum total of stuff accumulated by 2 married couples – kitchen stuff, books and CDs, clothes, computers, musical instruments, books and CDs, pictures, rugs, couches, books and CDs, tables, chairs, desks….did i mention books and CDs? Yeah, all of us had gone to seminary and 3 of the 4 of us were musicians, so we had a few books and CDs. Anyway, once we added 4 more neighbors to this living arrangement and of course their stuff, we had a house framed full of clutter – not junk mind you, just too much stuff for too little space! And we pretty much spent the next 14 years living this way. I guess after a while it just became natural for us. Not to say we loved it, we just couldn’t get control of things. And we always had people donating to our ministry which meant even when we got rid of some stuff, more stuff came. Plus, we always had someone living with us, so it was never just our stuff. It was everyone’s stuff! And for years all this stuff, all these possessions – ours and other peoples’ – just accumulated. In a way, we were possessed by our possessions! Maybe you have been there, too. When we finally moved back home, we had all our stuff crammed in my parents house, then we moved into my grandmothers and had all our stuff there plus my grandmothers stuff plus her house wears the storage facility for all my Williams family! This is all kinda funny because during our time in CLT we taught workshops on simplicity – how to live simply. Doesn’t sound like we did so – at least not in terms of physical clutter – but we really tried to live a very simple life in terms of money, jobs, and luxury. But honestly, those goals just meant more clutter. Our heads were cluttered with expectations, with ideals we were trying to live up to. We believed we should live simply in terms of our economic and financial lives – we had committed to living at the poverty line like our neighbors so that we gained some insight and understanding of at least their economic situation. We tried to live simply in terms of our daily routine – we practiced regular community prayer times through the day, we ate meals with one another and our neighbors, we committed to our local church, we gave our time to our neighbors and neighborhood. We lived simply in terms of our physical surroundings – no not in terms or minimalism, but in terms of luxury and lavishness. We had nothing new – everything was used, hand-me-downs, donated, or recycled, including clothes, cars, furniture, everything. Yet in trying to live out this lifestyle, we placed incredible expectations upon ourselves. We didn’t just want to do these things, we began to believe we had to do these things. That our faith meant we must do these things in order to be good and worthy. And all these expectations, all these burdens we heaped upon ourselves filled our mind, body and soul with clutter. So, you can imagine that when we moved back here a few years ago we needed some change. We began renovating our home a year ago. Our goal was to DECLUTTER – not just our physical space, but our mental, emotional and spiritual space as well. We wanted a simplified home, a simplified mind, a simplified heart. No stuff crammed on shelves. No ideals forced upon us. No walls plastered with pictures. No hearts plastered with hurt and burden. No closets with more than they could hold. No head with more expectation that it could hold. No drawers so full you couldn’t open them. No soul so overwhelmed that it couldn’t be opened. We wanted, needed, and long for space – physically, mentally, emotionally and spiritually – that would allow us to flourish. And do not keep striving for what you are to eat and what you are to drink, and do not keep worrying. For it is the nations of the world that strive after all these things, and your Father knows that you need them. Instead, strive for his kingdom, and these things will be given to you as well. Do not be afraid, little flock, for it is your Father’s good pleasure to give you the kingdom. Sell your possessions, and give alms. Make purses for yourselves that do not wear out, an unfailing treasure in heaven, where no thief comes near and no moth destroys. For where your treasure is, there your heart will be also. There are a couple of key phrases in our scripture this morning that guide us to think about lightening up and decluttering our lives. Wow! Exactly how I have described my own struggle! Possessed by possessions; burdensome expectations! Sell possessions and give to the poor —> so really about letting go! For where your treasure is, there your heart will be also – literally in the Greek: wherever your treasure room exists, there your heart exists. We are talking about something deep and spiritual here. Treasure is clearly a metaphor. Whatever your treasure is, wherever it is located, whatever shape or condition that treasure room is in, that is how your heart exists also. If ever there were a metaphor for tying together our heart mind and soul, for telling us that what we do, how we think, how we lives, what we believe, who we follow tells us who we really are, then this is it! If your life is cluttered, then your treasure is clutter! The implication is that if that is not what you want, then do something about it! Don’t worry, don’t keep striving after professions which posses you, and expectations that burden you Don’t be afraid to do let go. Life is more than all this! Look at the treasure room of your life and pay attention to what is in it! Maybe it’s full of too much clutter, too much stuff, too much worry, too much baggage, too many expectations, too many ideological burdens, too much fear. Clean it all out. Declutter. Get a little Marie Kondo on the treasure room of your life! Ok, so back to my story. Here’s what we did: we learned to lighten up! First, we lightened up our load. We let go of a lot of stuff. We didn’t do it exactly the Marie Kondo way, but we did go through stuff we have collected over the years and get rid of a lot! Clothes, old school notes we had saved for some reason, books. The biggest place I got rid of stuff was building materials I had collected over the years. I used to save everything leftover from a project….you never know when you might need that left over twelve inches of pip, that 1×2 section of plywood, those old hinges or that old electric chainsaw that someone gave you that never really worked to begin with. So it all needed to go…..either use it, recycle it or dispose of it. 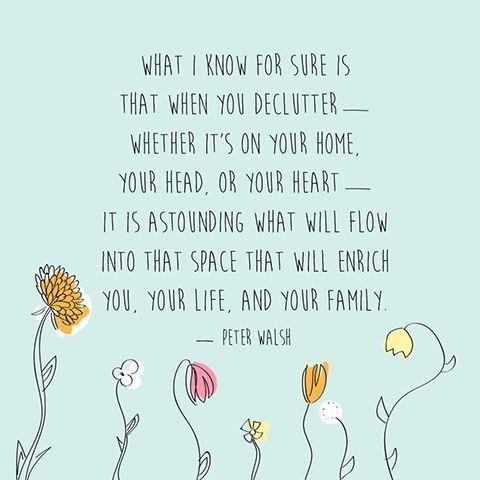 Deciding what is important to keep, what needs to go because you are not using it, and what just needs to find a new life with someone else is key to decluttering our lives. We did not just let go of material things. We let go of expectations that we had been heaping upon ourselves since about 2001. What we had always thought and expected of ourselves was not what was going to happened. Change happens. And we had to learn to de clutter our expectations to embrace the change that was before us. And that was, in the beginning, very hard and difficult, emotionally exhausting, and was painful work in the beginning. But it brought relief, peace, and renewal the more we lived into the change. You all helped with that. Our family helped with that. And here we are today! Second, we lightened up our space. We planned our renovated kitchen and living room to be simple but have plenty of storage…more than enough storage. One of our biggest problems over the years was just having so many people in so small a space. So, we now have a house that fits us and built it so that everything we have has a place to go – a place that isn’t crammed on a countertop or shelf! So, having space that fits your life and a life that fits your space is sooooo important! Now, we don’t really have a bigger living space at this point. We have just cleaned and renovated. And in doing so, we have created space that fits us, space that invites us to live, to flourish, to focus, to be present – all the things we have been talking about in Lent thus far! Space is a key to un-busy-ing your life! Third, we are learning to lighten up our life. What I mean is that all this is becoming part of the way we live. Decluttering is becoming a lifestyle. We are learning that you cannot just do this work one time and be done. Managing the physical, emotional, and spiritual stuff we accumulate as we live is ongoing work! You have to do it regularly, get the kids in on it, invite others to help, take time out for it and have fun! Let go of our worry, striving, and fear. Examine the treasure room of our lives and let go of the clutter. Renovate our treasure room, that is renovate our heart, mind, and soul in order to create space in which to live and flourish. So, this Lent, I invite you to join us: Let Go, Renovate, and Lighten up!